Where do we find ourselves at the start of 2014? Ignorance of Lyme disease is a huge problem: many GPs still believe that Lyme disease is not in their geographic area and some have refused to consider the possibility even when requested. GPs have an unrealistic reliance on the blood tests. There is no awareness even of the well documented reasons for negative serology in genuine Lyme disease cases. There is continued suspicion of internet-based sources of learning – even the Public Health England leaflet for GPs being rejected by one GP because it originated from the internet. Ignorance of Lyme disease has led to more rare and less likely conditions being considered instead of Lyme disease. Following years of misinformation, there is an often unshakeable belief in the sensitivity of serology and, as with GPs, little awareness of the possible causes of seronegative Lyme disease. There is no experience of the meaning of C6 EIA results or interpretation of nuances in immunoblots. Most consultants have no understanding of the blood tests. Overall, secondary care physicians seem unaware that they know so little, are very resistant to reading further and remain convinced that patients and patient organisations are misinformed. In some Trusts there is an ingrained, unquestioning trust in fellow health professionals that has resulted in serious risks to patient safety. The clinic is under-resourced and has a long waiting list. There is as yet little experience of anything other than sero-positive Lyme disease: this is something that any GP or consultant ought to be able to do. There are problems treating patients according to European guidelines as this is an out-patient clinic only with no option for IV treatment other than making a recommendation to the referring clinician. This brings inevitable difficulties for GPs. There are problems obtaining any necessary biopsies for analysis at RIPL. Funding is not yet secure. a rewrite of the old HPA web pages, which was committed to a year ago. There is an agreed action plan to move these and other points forward, however, so optimism reigns at least in this quarter. That we had a meeting with the Department of Health at all is Good News; that our presentation of this evidence above (which did not mince words) was received so well is very encouraging. We received a very sympathetic hearing and no argument was raised about the issues and the evidence presented. Ways of improving the situation were discussed and this conversation will be continued in the New Year. More cause for optimism. 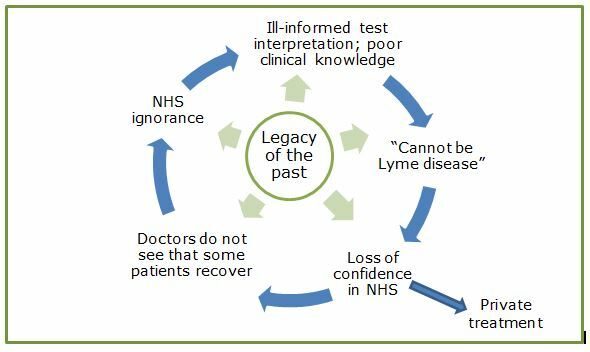 The UK member of the Ad Hoc International Lyme Group engaged in behind the scenes activism which has resulted in at least 10 years of mis-information being supplied to UK clinicians. Full test results were not reported by the previous Lyme specialist laboratory, so clinicians have no experience of test interpretation. The view that relapses are virtually non-existent and that chronic Lyme does not exist was repeatedly stated; often in peer reviewed journals. Patients and patient groups have been portrayed as seriously misguided. This legacy explains a lot of the attitude amongst doctors in the NHS and will take some time to balance out. It is notable that those with the main responsibility for taking decisions about diagnosing and treating Lyme disease – infectious disease consultants and neurologists – have been much more influenced than those on the receiving end of those decisions (GPs), or those consultants peripherally involved and out of range of the Ad Hoc Group. To be balanced in this state-of-play summary, we need to mention the other side of the equation. Public awareness of Lyme disease has increased through 2013. This can only be a good thing, but it does bring with it a difficulty: Lyme disease has received more publicity than other diseases with overlapping symptoms. It is understandable that someone reading a newspaper of magazine article will often suddenly realise that “Wow! those symptoms are just like mine!” and will then focus on obtaining treatment for a disease that is treatable with cheap antibiotics. That realisation often does bring a positive test result followed by treatment. Sometimes, however, a negative test result causes the person to search for public opinion on the validity of the test and to feed in their own, personal opinion that “the test is no good”. It is, in fact, the interpretation of the tests which is at fault, not the tests themselves. Public Health England maintains (on that long outdated HPA web page) that “Patients with late-stage LB are very rarely seronegative; there is greater than 99% chance that they will have a positive antibody response”. Now anyone looking carefully at the peer reviewed literature can see that this is simply not true and at one stroke, confidence in the doctor who says “you have a negative test result; you cannot have Lyme disease” is lost. That lost confidence is voiced through on-line forums and picked up by the next person who has a negative test result. People desperately want treatment for themselves or their loved ones to get them better – back to work, back to normal life. Where do they go for the diagnosis and treatment they are being denied? Private, often overseas, clinics. distrust of the NHS is reinforced. This is a simple feedback mechanism and all of it is fed by the legacy of the past.